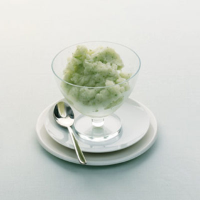 Basil gives this supremely refreshing sorbet a subtle yet sophisticated twist. For an equally refreshing cocktail, you could also add a shot of vodka and allow it to melt slightly. Simmer 220g granulated sugar with 220ml water for a few minutes until it has dissolved into a sugar syrup, then allow to cool. Squeeze the juice from six limes (which should yield around 200ml juice) and mix with the sugar syrup and a further 250ml fresh water. Pour into a freezer-friendly container. Stir in 12-15 whole basil leaves and freeze for 6-8 hours or overnight, until firm. Allow to soften for around 15 minutes. Put chunks of frozen mixture into a food processor with a further 5 whole basil leaves and blitz until smooth. Return to the freezer for 1-2 hours and allow to firm up slightly before serving. This can be stored for up to three months.